Buddha bowls are known for being packed full of a variety of nourishing and delicious ingredients. This month we’ve invited health food blogger Charlotte Roberts, aka @charleyshealth, to create a Strong Roots inspired Buddha bowl using our savoury Spinach Bites and she didn’t disappoint! on social media. We love hearing about your creations! Preheat your oven to 180°C and cook the Strong Roots Spinach Bites according to the instructions on the packet. To make the coconut bacon, combine the tamari, rice syrup, ginger, paprika and water in a bowl and mix to create the marinade. Place the coconut chips in a frying pan over a medium heat and sauté these to toast slightly. Pour over the smokey marinade and cook until the chips are caramelised and crisp. Transfer onto a large plate or tray and allow to cool (to store, keep the coconut bacon in an airtight jar or container). Slice the sprouts into halves and heat a little bit of olive oil in a frying pan over medium heat. Add the sprouts and sauté until nice and crisp. For the dressing, combine all of the ingredients listed and mix well until nice and smooth. 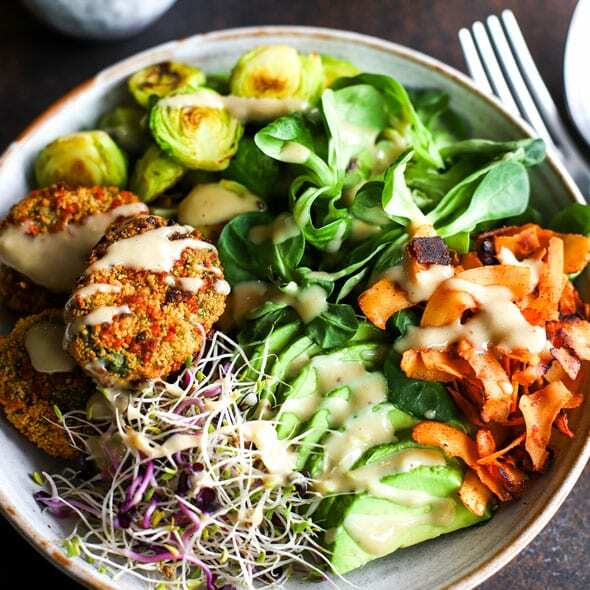 To assemble your salad bowl, add the salad leaves, sprouts, brussels, sliced avocado, Strong Roots Spinach Bites and drizzle with the tahini dressing. Enjoy!